Happy Anniversary! Congratulations on making it to the big 1-0. Your gifts of aluminum, diamonds, and tin are in the mail! Well, maybe. 2002. The same year I had caught wind of Bonnaroo, I had also heard of this new festival popping up in Austin. As I only had enough gas money for one festival, I opted for the closer choice and went with Tennessee instead of Texas. If only I had known then what I would be doing today. Covering both festivals for their 10th year in existence. Note to former self, current self is mind-blown. Thanks. 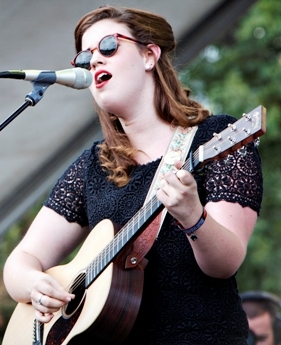 Last year, Austin City Limits was held in October. Don’t be fooled, it’s still warm, but not nearly as bad as Texas during the summer. The brutal unwavering heat was going to be one of my only concerns this year as the festival was moved to mid-September, raising the probability that the temps would be hovering in the triple digits. The high heat and no rain was already leaving Texas with drought-like conditions which only catered to the raging fires that were knocking on Austin’s doorstep. A burn ban had been placed in effect and leading up to the festival, notices went out requesting that people do not smoke in fear of torching Zilker Park. I had been diligently checking the weather forecast to determine if my fate included sweating like crazy, but alas, there was a smidge of rain in the forecast and temperatures in the 90’s. This would be tolerable. Gear packed and a last minute stop at the store for umbrellas and other forgotten essentials, a co-worker, Lane, and myself hit the road. Nearly 5 minutes into our road trip adventure, we almost got into an accident. Crazy person slammed on their brakes, we slammed on ours and the front bumper of Lane’s car nearly kissed theirs. Nothing like kicking off the drive to ACL with a little excitement! Thankfully the accident was averted, nerves were calmed, and we headed out of town at a decent hour on Thursday. Like last year, a pit stop was made in West, TX. Oh Little Czech Stop, how I adore thee! So far the best kolaches I’ve consumed in this state. Yum, yum! After stuffing our faces, the rest of the time spent on the road went by fairly fast. Arrived in Austin proper just after 8pm, settled into my temporary home close to the park (a HUGE thanks to Jeremy and Joanna for allowing me to crash with them again this year), and prepared for day one. Friday started off rather slow and wet. The 1.8-mile walk was just peachy until it decided to downpour. Love rain and all, and it was definitely much needed, but not cool when you are rocking a bag full of camera equipment. Enter a pause to get things covered and safe from the rain, and a brief stop into Juiceland (formerly the Daily Juice on Barton Springs Road—best juice and smoothies ever!) Jeremy and myself managed to get into the press area to pick up the credentials in a very timely fashion. We actually didn’t spend over an hour searching for it this go round, so that was good! First band on my list for the day was The Secret Sisters. Real-life sisters Lydia and Laura Rogers are best known for their vintage spin on the modern day country scene. Their graceful harmonies were a perfect match for the overcast skies, creating a calm that seemed to captivate several. As I was heading over to the Google + stage I overheard an older gentleman asking his wife if Patsy Cline had been reincarnated. As a huge fan of Patsy, and also now of The Secret Sisters, this guy could not have been more spot on. Not only do their voices blend well to the tunes of yore, they bring a sense of nostalgia with their stage presence. Perhaps it’s the ruby red lipstick, classic meets retro attire, victory rolled hair, but whatever it is, these girls definitely have it right. Patsy would be proud! They played a little Hank Williams, a little Patsy Cline, and even an obscure tune by Skeeter Davis before wrapping up their hour-long set. Even though the crowd had dwindled from when they first started, I was glad I stuck around. Before heading over to catch Brandi Carlile, I stopped off for a refreshing watermelon agua fresca in the “Austin Eats” area of the park. The likes of Chef Tim Love’s Lonesome Dove, Love Shack, Torchy’s Tacos, The Daily Juice, and several others made the cut this year. If you weren’t hungry when you arrived to Zilker Park, your mouth was sure to be watering after catching a whiff of Salt Lick BBQ or truffle laced macaroni and cheese. Near the food was the Vista Equity tent, which at the time was showcasing Disciples of Christ, a gospel group from Houston, TX. Whatever your religious preferences may be, I feel that anyone and everyone can appreciate a little bit of gospel music every now and then. I only caught one song before their set ended, but judging by those in the tent that had been there awhile, these ladies put on quite a powerful performance. 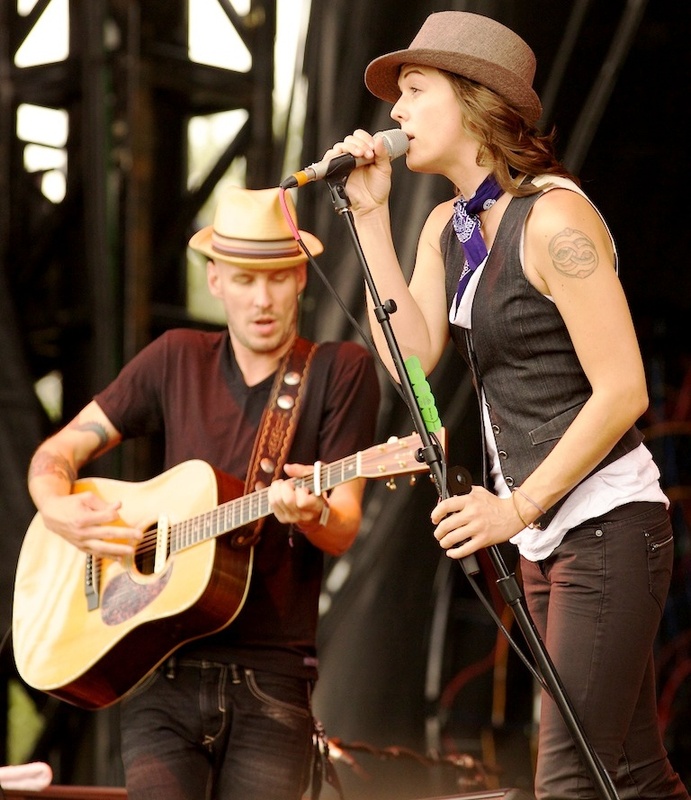 It was definitely a nice segue way into another female vocalist that packs a punch, Brandi Carlile. She’s always stuck out in my mind as the girl who did a most hauntingly rendition of Jeff Buckley’s “Hallelujah”, but as of late has proven to be much more than a girl who can sing one hell of a cover. Her most recent release of Live at Benaroya Hall in which the Seattle Symphony accompanied her is definitely a live album I would urge anyone and everyone to give a listen to. Unfortunately not having the whole Seattle Symphony in tow for ACL, Brandi still managed to knock out a solid performance with a killer set of folks accompanying her—there was even a fiddler. She opened with “Dreams” off of her album Give Up The Ghost and ended up paying tribute to the “Man in Black” by singing “Jackson” and “Folsom Prison Blues”. She also sang “Raise Hell”, “The Story”, and ended things on a 1980’s note with a cover of Alphaville’s “Forever Young”… cue the school dance scene from Napoleon Dynamite. If this didn’t showcase her love for the eighties, perhaps her clever Neverending Story tattoos did. All in all, Brandi did a fine job and definitely rolled with the last minute line-up and stage change with grace. 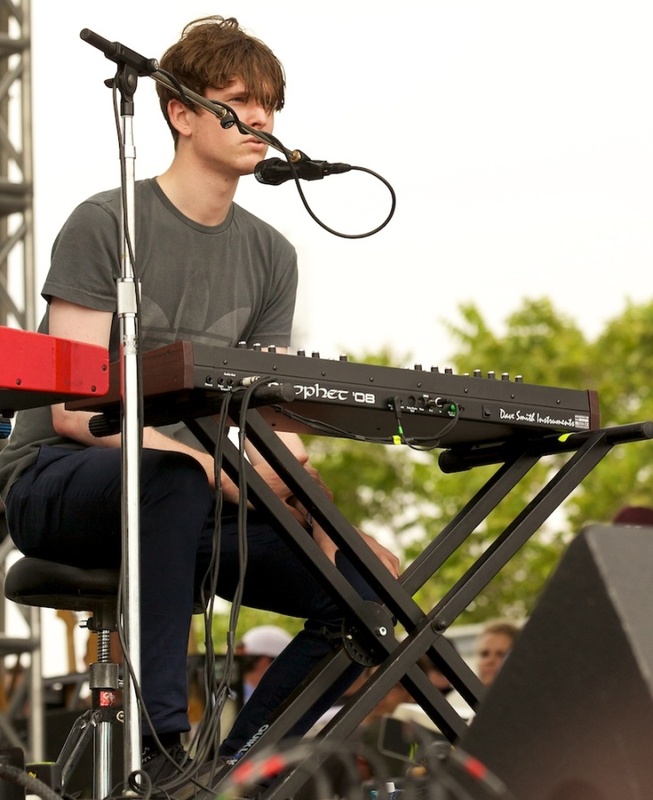 Over on the Honda Stage, James Blake was taking the stage for a late afternoon set. Hailing from London, the electronic-soul front man put on a rather understated performance visually, but musically was spectacular. High points included "I Never Learnt To Share" and his popular cover of Feist's "Limit To Your Love" both off of their eponymous debut LP. They also debuted an early single “CMYK” for the very first time in the US. Overall, Mr. Blake was able to keep quite the audience in tune with his demure set and executed it brilliantly. While Blake was wrapping up, Austin’s Electric Touch was getting underway. Wildly energetic and by far the most youthful and exuberant performance of the festival thus far, those in attendance had no idea what the band had in store. Christopher Leigh pulled off the lead guitar duties handily while doing his best Keith Richard's impression and Shane Lawler stole most of the attention for his electric, hair raising, and totally rock and roll vocals. The crowd grew larger and larger as each song passed and more people got caught up watching the spectacle. There was even a moment when the band pause to take a photos for their Facebook page by thumbs-upping the crowd. Golden. Wanting to keep the energy going, I decided to go check out another act from across the pond. His royal awesomeness, Beardyman. Darren Foreman, known as Beardyman, is a London-bred beat boxing genius. He holds two titles as the UK Beatbox Champion for 2006 and 2007 and can blow the minds of whoever crosses his path. 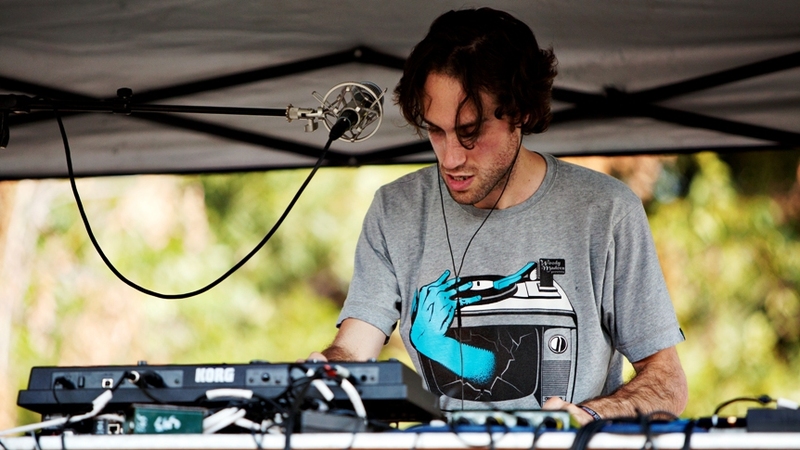 Sporting a minimalist beard of sorts, Beardyman set up shop on the BMI stage under a small shade tend. Cord were interwoven and running from electrical outlets to various pieces of electronic equipment, it looked as though we might have a repeat of Deadmau5 from last year (silence, anyone?). As long as the power didn’t surge we knew we were in for a spectacular one-man show. Layering beats/vocals/effects while ingeniously singing iconic songs, he asked the crowd “Can I kick it?” to which we responded “Yes you can!” Clever looping, lots of bass, and the occasional throw back to old school hip-hop, Beardyman owned it and delivered an astonishing set. One can only hope this isn’t the last we’ve seen of him. Come visit Texas again soon, Beardyman! As things over at the BMI stage were winding down, Foster the People were setting up shop on the Google + stage. All I can say was what a crowd! So many people showed up for their highly anticipated set rivaling the crowd they had while playing at Lollapalooza earlier this year. Given their quick rise on the charts, I thought perhaps a larger stage was in store for them, but alas, it wasn’t. While packed in like sardines, Mark Foster graced us with his presence rocking a pink long sleeve shirt to which he sweated like crazy in thanks to the sun making an appearance. Need we remind you that this is Texas, Mark? It gets hot round these parts. Whether he was sure or unsure (how that deodorant commercial surfaced, I will never know), Foster started things right with “Warrant”, “Miss You”, and “Houdini”. They played nearly their entire album Torches and in almost a clichéd fashion, ended with their biggest hit this year, “Pumped Up Kicks”. Even a woman in her late 50’s near me was singing along with her daughter who was in her 20’s, thus adding to the notion that their sound does span the generations. Notably, the band wasn’t there just for the music. They also had their “Do Good” bus near the festival entrance that follows them on tour and picks local charities to support. While in Austin, they were helping to raise money for the firefighter’s relief fund. It’s nice to see bands taking a stand, raising awareness, and helping out various communities. After what seemed like an eternity, I had finally pushed my way out of the crowd lingering around the Google + stage and made a break for the AMD stage. I wanted to be somewhat close for Coldplay. I stopped off at one of the nifty CamelBak water stations to load up on liquid for the evening before weaving my way close and closer to the front of the stage. Free water is amazing, especially when it doesn’t taste like a sewer! Yay for filtering the water, you get an A+ in my book, CamelBak! Hydration is always key to surviving a festival, especially if you are packed in near the stage. Pit stop completed, I made my way over and ended up catching the very end of Bright Eyes. 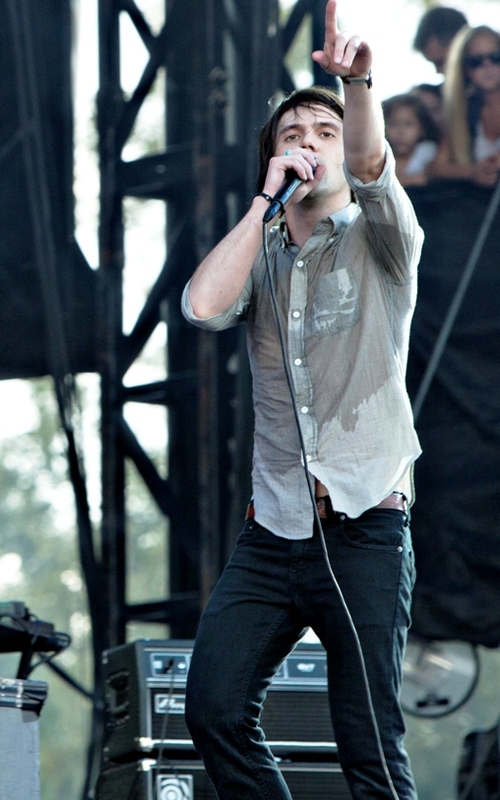 Last year Conor Oberst was at the festival playing a massively long set with Monsters of Folk. This year was a bit different. Having released a new album The People’s Key earlier this year, it was time to resurrect Bright Eyes and give the live shows another go. Catching the last couple songs of their set (“I Believe In Symmetry”, “Road to Joy”, and “One For Me, One For You”), I was oddly reminded of how much Conor resembles the late Elliott Smith, hearing his influences throughout the songs. He jumped off the stage and made some gal right on the gate swoon as he held her hand, locked eyes, and serenaded her in front of thousands. Not that I was jealous, but anything would have beat the highly intoxicated girl that was right in front of me. She apparently had one too many free drinks at one of the VIP tents and decided to be our very own “Tiny Dancer”. Thankfully she didn’t throw up like I had predicted and as the Bright Eyes set was nearing an end she decided to bail and run to Kanye. One could only imagine there was a face-plant into the luscious Zilker Park grass done somewhere along that journey. Running and alcohol do not mix! After the distraction left, Conor must have felt it was time to make his exit and shouted to the crowd “Merci Beaucoup, Austin!” It was officially time to get excited for Coldplay and judging by the stage set up, we were in for one hell of a show. Throughout the day everyone was commenting on how hard it would be to pick between Coldplay and Kanye. Some were going to try and split the field and see half of each, others were going to be solely dedicated to a stage. 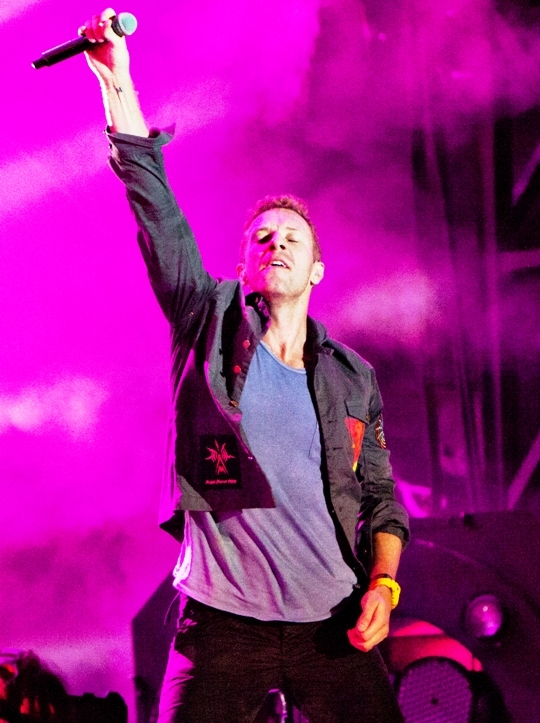 Ryan Halsey from Fort Worth, TX expressing how he decided whom to see, said, “Definitely, Coldplay. Been wanting to see them since before I was born.” I had to agree. Given the fact that Kanye is set to tour with Jay-Z this fall and Coldplay only has a handful of tour dates left, my ultimate choice was Coldplay. 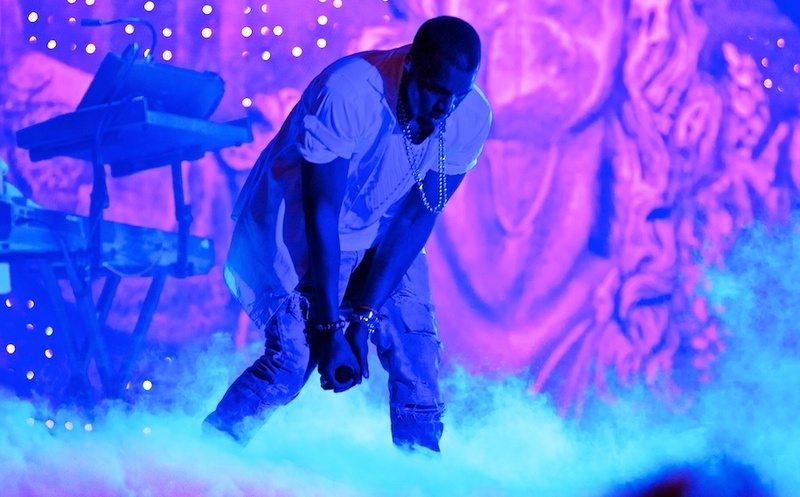 That and if Kanye was going to pull a repeat of Bonnaroo 2008, I did not want to be disappointed. If there was time after Coldplay, I’d make a valiant effort to catch the end of Kanye’s set. Rounding out a U.K. dominated day in Austin, Chris Martin and company waltzed onto a very colorful stage (multi colored lights in the shape of giant dream-catcher like sculptures, black light sensitive neon paint adorning all equipment) and graced us with a new song right off the bat. Mylo Xyloto off of their upcoming October album that bears the same name. It’s not as powerful as some of their notable songs that they decided to play towards the middle and end of their set, but certainly one that will grow on you. Highlights included hearing “Yellow”, “In My Place”, and “The Scientist”. They spanned most of their impressive catalogue throughout the evening. Between the lights, sounds, and Chris Martin’s insanely charged performance, I felt I had picked the right headliner for the evening. He paid homage to the late Amy Winehouse by singing snippets of “Rehab” and also busted out some impromptu lyrics that acknowledge the split field for their show and Kanye’s. “When your girlfriend wants to watch Coldplay and all you boys want to watch Kanye.” This couldn’t have been truer, but at least the smart boyfriends of the evening didn’t go join their fellow dude-bros at the dramatically over the top rap-opera across the park. Thankfully. The night was rounded out with “Clocks” and my personal favorite “Fix You”. If ever there was a more appropriate time in my life to hear that song live, I think being in that place, at that time, was definitely it. Definitely a set of humble performers, everyone took their bows and thanked the audience graciously before exiting. Across the park, the bass was in full force and an eerie pink and blue glow was lighting up the skyline. As Kanye was set to play for another 30 minutes, I figured I’d go give him a shot before calling it a night. It was rumored that Jay-Z might be making a guest appearance as Kanye and him recently released Watch The Throne, but this never came to fruition. The crowd in front of the Bud Light stage was getting restless intermittently chanting the remaining time every 15 minutes and throwing Delta (aka Diamond) hand signs praying for a surprise cameo of Jay-Z. That didn't materialize, but people's anticipation of surprise was satisfied nonetheless when Kanye seemed to literally appear in the sky aboard a brightly lit platform during an instrumental intro to H.A.M. from Watch The Throne. From every person I talked to that decided to opt out of Coldplay and catch Kanye instead said that his theatrics were in full swing. Between the lights, ballet dancers, and paying tribute to the late Michael Jackson, he put on quite the show. Indifferences and egos aside, Kanye does have some pretty fantastic songs. Crowd favorites were definitely “Jesus Walks”, “Flashing Lights”, “Heartless”, “Gold Digger” and “Stronger”. Even after the music stopped, people were still trying to find out if they made the “right” choice for the evening. I was happy with my decision. Hopefully you were too!